It is projected the 1% CSFT sales tax will generate almost $23 million a year to fund school improvements across Madison County and allow school districts to bring property taxes UNDER CONTROL. 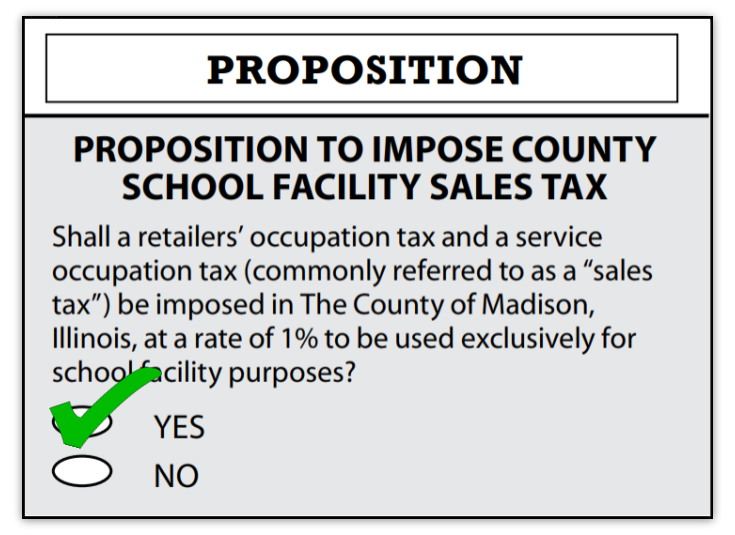 WHY WOULD INDIVIDUALS WHO PAY PROPERTY TAXES IN MADISON COUNTY BE INTERESTED IN THE COUNTY SCHOOL FACILITY SALES TAX? Property owners now carry the heaviest burden for paying school facility maintenance, renovations, construction, and improvements. Currently, school districts must issue debt to pay for larger school facility needs which is funded through property taxes. The sales tax is alternative way to “share” the cost with visitors shopping and staying in Madison County and not rely as heavily on those who pay property taxes. There is a lot of misinformation and inaccurate statements that the CSFT will raise your property taxes. The truth is CSFT and property tax relief are a package deal. Property taxes are a LOUSY way to fund schools. They’re unfair to taxpayers and to students alike. We are Voting YES on the CSFT because it’s time to break the grip of property taxes on local school finances! Each district in Madison County has different amounts of debt that can paid with CSFT revenue. For instance, if the 1% CSFT sales tax is approved by voters, Triad CUSD will use over $1 million of revenue annually to pay off existing building debt. Triad property tax rate will decrease approximately 23 cents, saving the $100,000 homeowner $77.47 annually. To see how property tax will be affected by CSFT in your district, visit the “How Can This Help My District” tab. WHAT IS THE DIFFERENCE FROM PAYING FOR SCHOOLS THROUGH PROPERTY TAXES OR SALES TAX? SCHOOLS ARE STILL FUNDED THROUGH TAXES. WHY WOULD I SUPPORT ANY NEW TAX? The CSFT is a fair deal for Madison County taxpayers since it is collected from all consumers, rather than just property owners. Home values rise and fall, subjecting local school districts to unfair budget turmoil. The 1% sales tax is spread over a much larger number of people including those who pass through the county, which proportionately decreases any impact on the local consumer. Also, depending on home values, what the average person spends in sales taxes on an annual basis is usually far less than their property taxes. The CSFT funding method will reduce the need for the school districts to rely heavily on property taxes for school facilities. Madison County residents already pay CSFT in 49 other counties across the State of Illinois and help fund THEIR schools. We now have the power to have visitors to Madison County help fund OUR schools and help take the burden off the property owners. I’VE HEARD THAT ONCE THE 1% SALES TAX IS PASSED THAT OUR SCHOOL DISTRICTS CAN ISSUE GENERAL OBLIGATION BONDS, OR “DOUBLE-BARRELED” BONDS THAT WILL GRANT THEM ACCESS TO INCREASE MY PROPERTY TAX. If the 1% sales tax is approved, there will be no need to issue bonds that are paid by property taxes. The sales tax is estimated to generate almost $23 MILLION in revenue for property tax relief and our school facility projects. This eliminates the need for bond financing. For example, a $500,000 health life safety project to replace an HVAC system at Granite City High School would be able to be funded by the sales tax instead of by local property taxes.